Day-of Schedule for Your Guests! 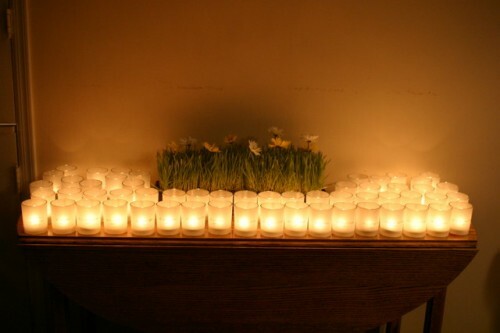 The one big change I made was the use of larger votive holders. Your average holder is about 2” in diameter and I wanted something with a big more substance so I hunted down 3” one’s which came out really nice. 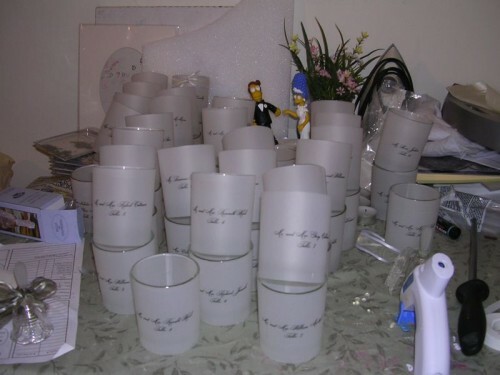 Step One: Measure your votive holders to determine the approximate height and length around. Using these measurements, make a template of the shape of your label. 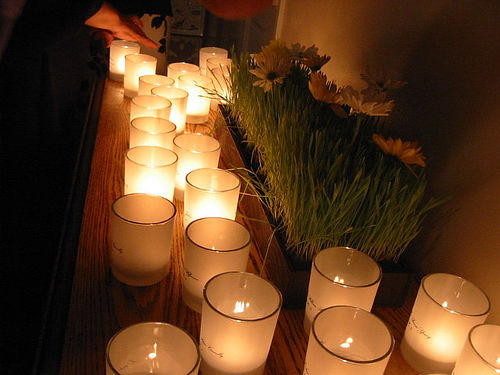 Note that even the most plain votive holders will have a slight curvature, so expect the template to be in an arch shape. Transfer this template to a piece of cardboard. The cardboard is firmer and easier to work with than a piece of paper. I originally used a piece of paper, but found the cardboard template to be much faster. 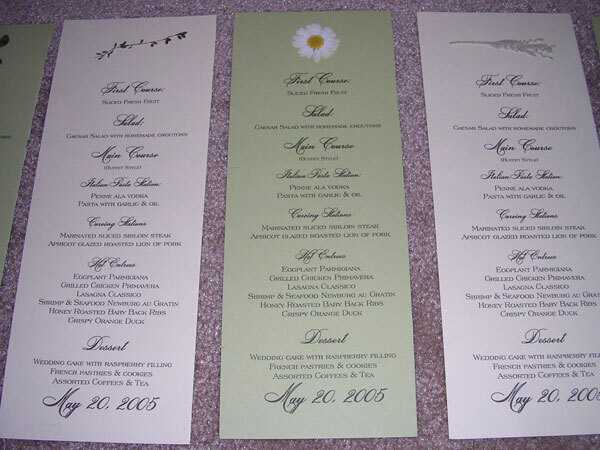 Step Two: Using the approximate measurements, set up your MS Word (or any other graphic program that is useful for printing text) document to space your guests names and table numbers the right distance. In my case, I got 2 to a page with a little room for error. 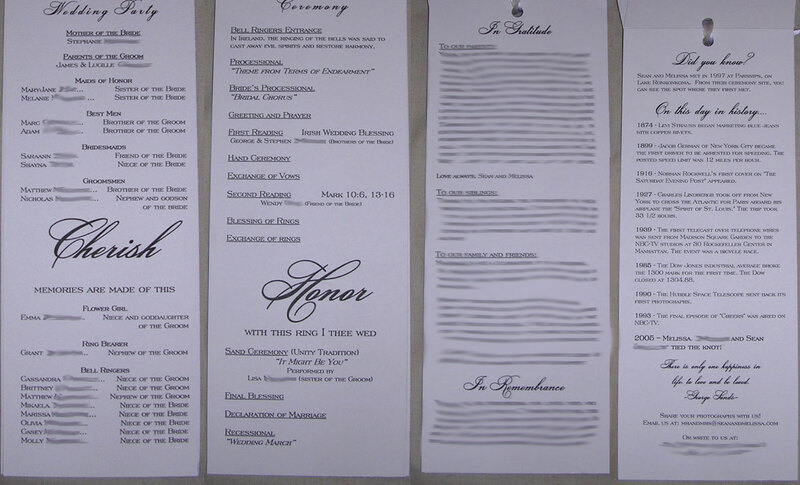 Step Three: Print out your place cards and using the cardboard template, cut each one out. Set the labels aside. 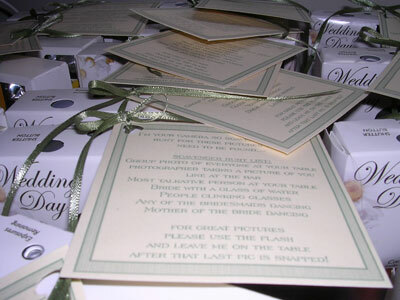 Step Four: Set up a large workspace with all your votive holders, labels, double sided tape and scissors. 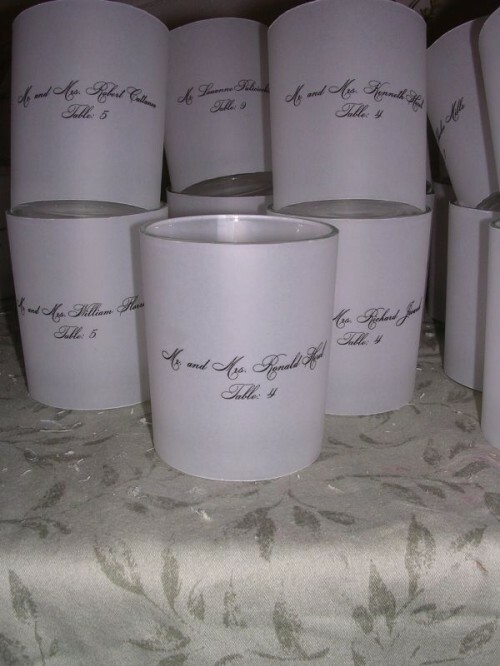 Wrap one label around the votive and trim accordingly. When the label is lined up correctly, it will lay relatively flat. Apply the double sided tape and put aside. 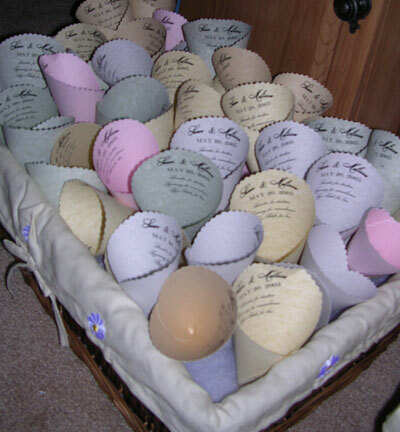 Having all of the candles in front of you will allow you to keep a consistent appearance of the candles and give you a preview of what they will look like all lined up at the wedding. 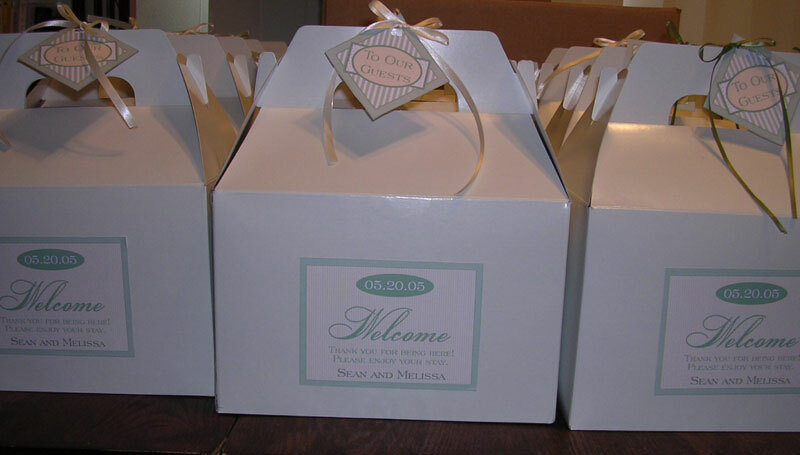 Have candles lit no more than 30 minutes before your guests come to pick them up to ensure they are all still burning when the last guest leaves your reception. 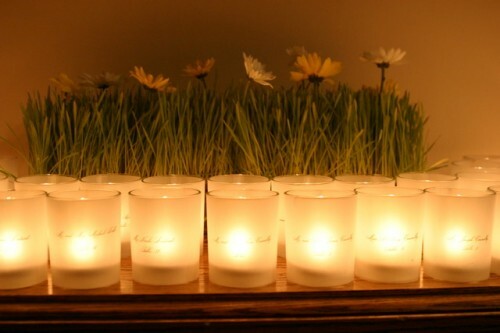 Using tea-lights in place of votive candles will result in the candles getting warm but not too hot to touch. However, there is melted wax inside the votive so better to keep away from children. Don’t use a glue gun to apply labels. I tried the double-sided tape at first and didn’t like the seam on the back of the votive so I changed it out and used a glue gun. Once you light the tea-light inside the glass gets warm and the glue will melt. I had to redo over half of them with the double sided tape. It turns out, once the tealights are lit, the tape seam in the back is barely noticeable. First I used the layered program template from this site, and altered it a bit, so that instead of layers with the sections listed below, I would have pages all the same length and a small saying (Love…the greatest gift. Cherish…memories are made of this. 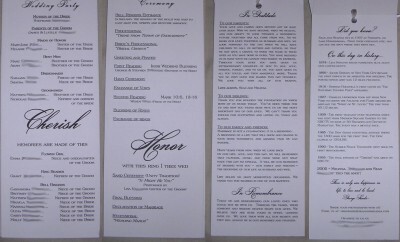 Honor…with this ring I thee wed) depending on the page. I printed all the pages out first. Then I cut them with the paper cutter and put them in page order. 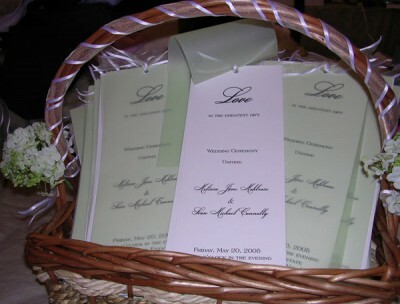 Then, like an assembly-line, I put each program together and hole punched one at a time. These are petal cones. Or, in my case…herbal toss cones. 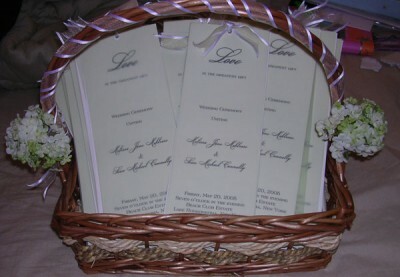 I’m throwing a mix of herbs from weddingpetals.com. I haven’t put in the herbs yet, but will post a pic once I do that. I went to Michael’s and purchased pastel colored paper, which had a very soft “cloudish” pattern. 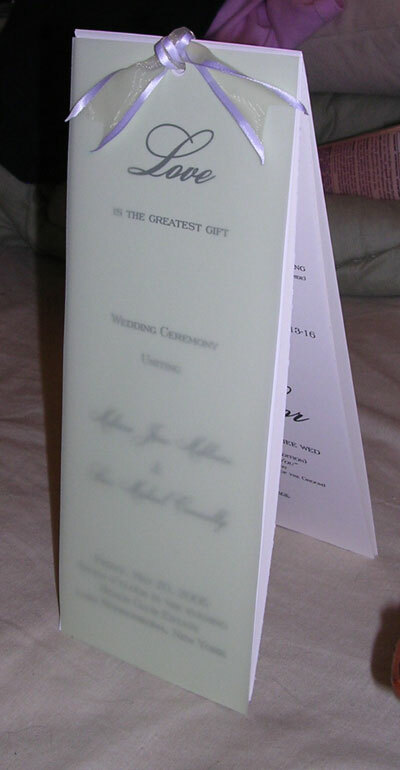 Then I used this template, and printed it out on each piece of paper. After I was done printing, I cut along the line with a scalloped scissor. I attached the one side of the cone to the other with a hot glue gun. Press together for 5 minutes and put aside. 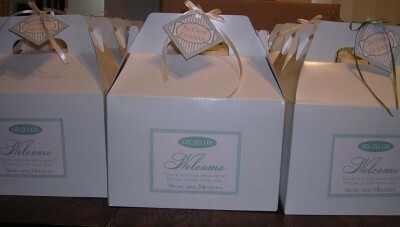 I went with gable boxes, which I purchased on ebay from another bride who had some leftover. The cheapest I found online (other than this one auction) were from uline.com. You could always resell your leftovers online, if you don’t need that many. First thing I did was a test with the boxes, to make sure I would be able to fit a lot of stuff into them. And indeed, I was able too. They look small, but they are pretty roomy. Since I planned on putting in some beverages, I needed to reinforce the bottom of the boxes with clear duck-tape. 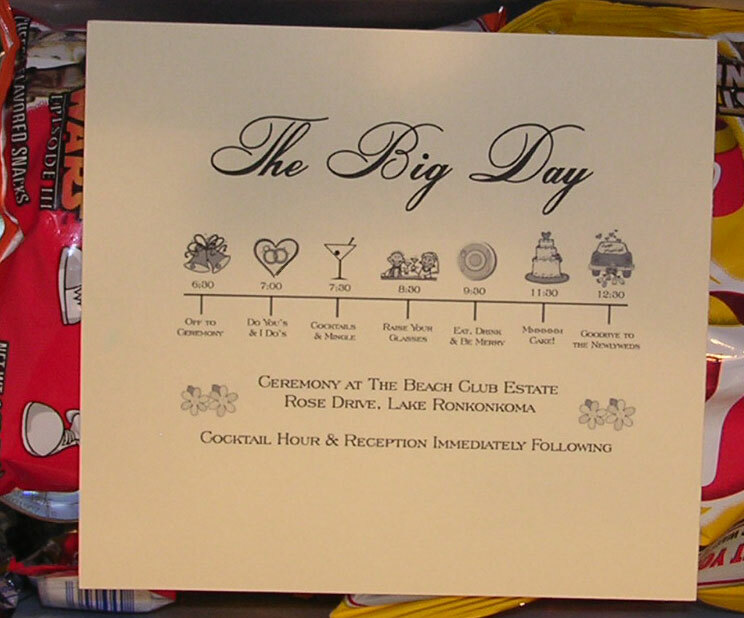 I highly recommend doing the same, as the bottoms could give out when your guests take them to their rooms. I bought all my items from Costco. 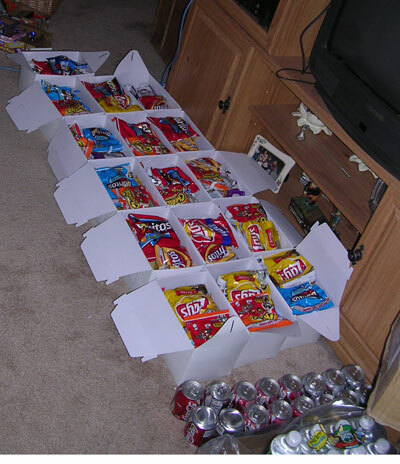 I got an assortment of bottled water, canned soda/ice-tea, chips, candy, cookies, granola bars, coffee/tea packets, aspirin, gum, tic-tacs and other assorted treats. 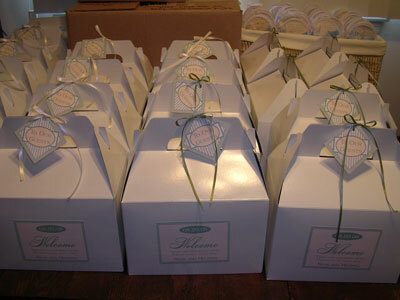 Then I packaged all my boxes with an array of items. 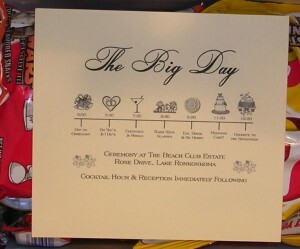 And before I closed up the boxes, I put in the Guests Day-of Schedule and invite for the Day-After brunch. So, I purchased a bunch of cameras online, but I didn’t want to just throw them on the table. 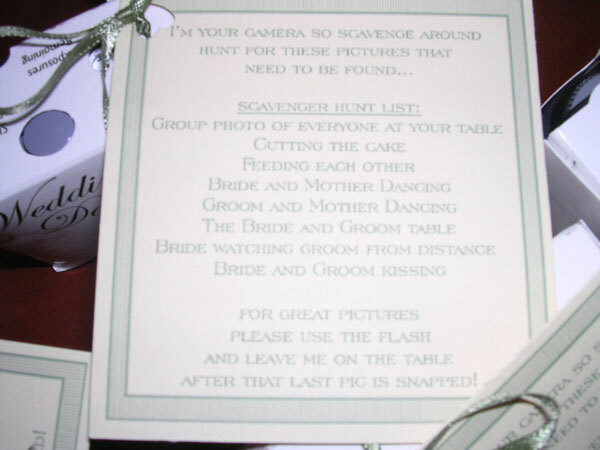 So, I had seen other brides do this “Camera Scavenger Hunt” where they attached a little note to each camera, with directions, or put a piece of paper on each table with instructions on completing the scavenger hunt. Since I have so much on my tables already, I wanted to attach a short to-the-point message, on each camera. I created these “tags” in Photoshop, to match my color scheme. 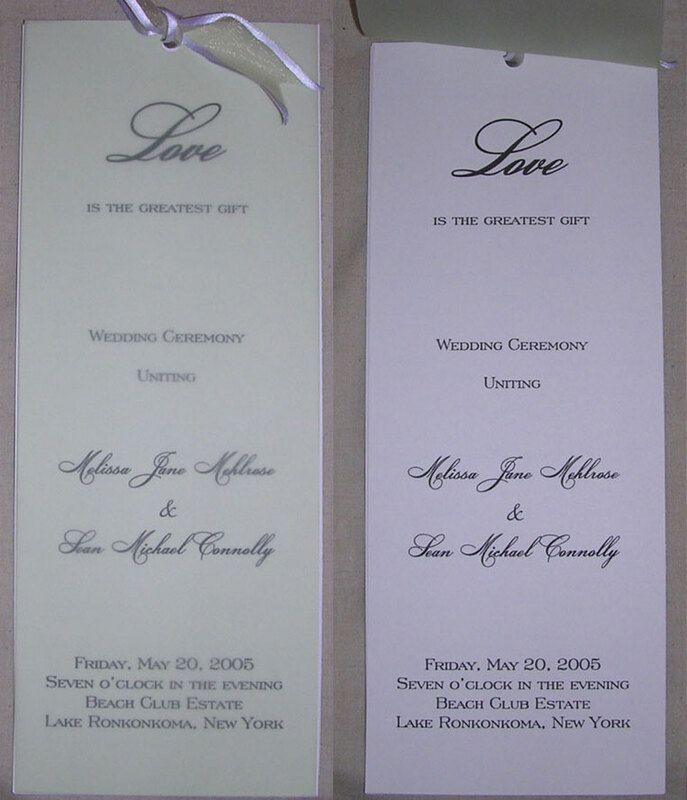 (sage/celedon and ivory) then printed about 8 to a page and then attached each one, to each camera, via ivory/sage ribbon. -Take a picture of someone UNDER the table! -Person Least Likely to get married! -A picture of the bride and groom when they don’t think anyone is watching them. -A picture of a couple OTHER than the bride and groom acting like newlyweds. -Person most enjoying themselves on the dance floor. -Someone hoping no one is watching -Someone who looks thrilled to be there! I picked up a set of three baskets from Michaels. I used the two smallest for the bathroom baskets. Then I went to work trying to get everything in the basket and accesible. It was relatively easy. I was also able to obtain a ton of perfume/cologne samples from Macy’s (my mom had been saving them up for the past year ) and I put an assortment of perfume in the women’s basket and an assortment of cologne in the men’s. So happy you’re here to share in our special day! 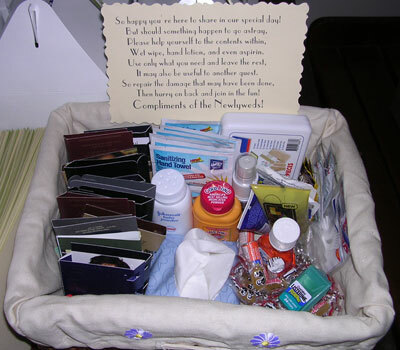 Wet wipe, hand lotion, and even aspirin. 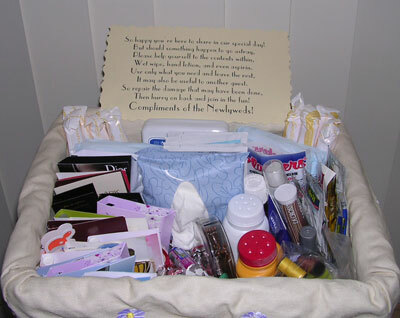 It may also be useful to another guest. Then hurry on back and join in the fun! I placed these in my OOT boxes. 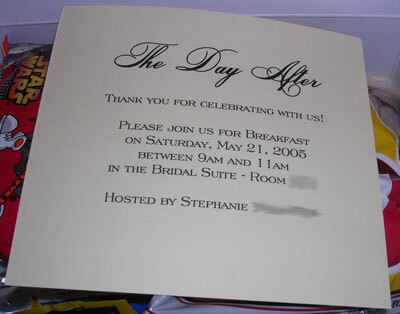 One side was the “Day-Of” schedule, the other side is the “Day-After Brunch” invite. First thing I did was grab some cute clip-art from clipart.com. You can also hunt down some cute icons via a google image search. Then I created a new document in Photoshop, and went to work plugging in each icon with the appropriate time/text. Then I saved it and inserted the saved image in a new word document (I sized it so I could get two on a page). Then printed them out. Guest Time Line Photoshop File. Please note: if you don’t have photoshop or don’t know how to use it, you will probably want to do this in word. I’m sorry, but I do not have a word file for download. Only the photoshop file. My next DIY project - menus! I purchased my paper from AC Moore. I got half in sage green and half in ivory and printed them with my home printer. Once they were printed (2 to a page - lengthwise), I cut them in half. Then I attached the herbs using my hot glue gun. (wonderful dried herbs purchased from naturespressed.com) It was relatively simple (though not painless! that glue gets hot!!!) but time consuming. I wanted the glue to be as invisible as possible, so I took my time applying the thinest smallest amount of glue to each herb. then I purchased white, black and yellow acrylic paint and some small paint brushes from Michael’s. Then I painted each of them. Homer got a black tux with a white shirt and a small daisy flower and Marge got everything painted white. I glued together the two pieces of styrofoam with my hot glue gun, then I covered it with the satin…I just glued it all to the bottom of the styrofoam pieces and then covered all the nasty edges with a round piece of satin fabric, which I then glued over everything else on the bottom. Then I added the daisy accessories to the top of it, where Homer and Marge stand. I just placed them randomly on top. And I added a stripe of ribbon around the side of the styrofoam, with small little bows on each side, and some white rose buds above that. Then I glued the bottom of their feet to the top of the satin, via a hot glue gun. I pushed down really hard so that the glue would sorta stick to the styrofoam too. 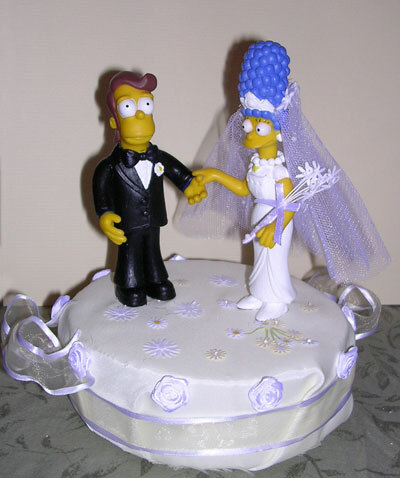 And viola…our custom homer and marge topper.